It began with the desire for a better way to hit the road. Then it grew into the idea of a smart driving system that gives you real-time notifications on every trip you take. Now it has become our goal, to make a smarter way to drive available for all—because we believe safe driving shouldn’t be a luxury reserved for the few. That’s why Anker is excited to introduce Roav, the smart driving system, and its centerpiece, the Roav Dashtop. It all starts with the unique head-up display (HUD) of the dashtop, which takes important information from your car or smartphone and projects it on the road ahead. Since it’s tethered to an interlinking WiFi network of other complementary devices, it provides vital insight to everything from real-time traffic alerts to checking your blind spots. Along with the freedom to customize which Roav smart gadgets you pair together for improving your drive, we’re making an app store available soon, so you can add even more functionality whenever needed. 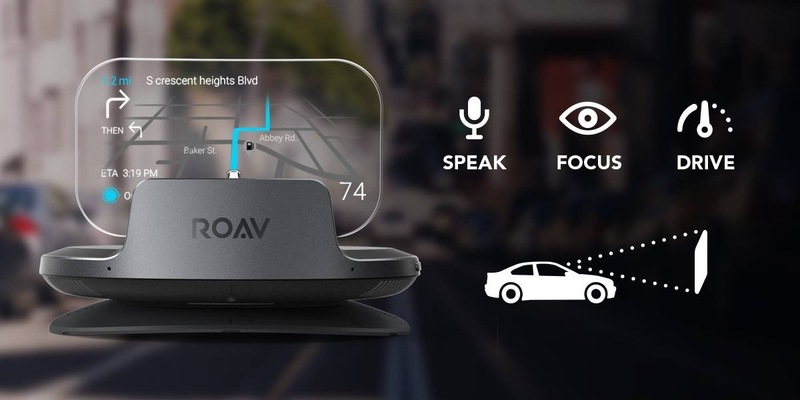 To sum it all up, you now have the ability to stay connected to what matters most without diverting any attention away from the road or taking your hands off the wheel. More functionality and less distractions, it’s a winning combination. With pre-orders available November 14th, and a limited-time savings of $200, the excitement continues to grow. For more information about Roav or to get your hands on your very own dashtop, visit our website and check us out. This looks a fantastic and handy product! how long will preorder discount last? Although I wonder if the 4g model could be used for tracking if vehicle (or unit) is stolen? Definitely sweet, nervous about a new product like this. Might wait for the second go around. Looks sharp! Looks cool! I hope the US version will be able to use any SIM card as well. This looks like a very cool product! Two things give me pause personally, the price and then connectivity. The connectivity is probably the bigger issue in the long run. If you tether to your phone, you'll be chewing through data but also draining your phones battery at the same time. There is an LTE option, but the last thing I want is yet another cellular account. I'd really love to get a test unit if at all possible. Even if it has to be sent back after. Im all about new gadgets and this would be perfect for my job. This thing looks great, I just checked the video on https://www.goroav.com/. I would get the wifi version that tethers off my phone. If you tether to your phone, you'll be chewing through data but also draining your phones battery at the same time. There is an LTE option, but the last thing I want is yet another cellular account. Despite the 4G model only being for US customers, I would have gone for the non 4G model just for this reason anyways. These days data is cheap as chips on most carriers. I'm on a SIM only plan for £11 a month with 500MB of data and despite daily use for emails, some web browsing and daily GPS for my dash camera app, I barely scratch the 300mb threshold on average per month. I didn't like the commercial for the Roav I feel like it didn't do a good job of showcasing what it can do. Interested to see other videos on it. This looks interesting, but I think it will a distraction for me. Maybe it's the video show casing the device placement directly above the driver's line of view (or maybe I'm short). I'll wait for reviews. This product looks really cool, But with all devices how well supported will this device be. Will it only be supported for a year and then everyone forgets about it? I really want to get one, but that's a lot of money to spend for something that might just see the light of day for a year.